The first time around with breast cancer I decided not to bother with eating a lot of hippie food. I was going to eat a normal, recommended diet and forgo the quinoa, the seaweed, and other strange things you eat a lot of if you are freaked out about cancer. I did check with my doctors who said that 3-5 glasses of wine per week were safe - no more - so I kept to that number. But I did not cut out red meat, or dairy, or sugar, or white flour, or fried foods. I tried to eat the really bad stuff sparingly but I ate mostly whatever I wanted. This time around I am ready to follow best practices with food. The metastasis is on my liver so my digestion had become poor anyway. As soon as I heard there was a possibility of a problem on my liver, I went off coffee, sugar, meat, cream and alcohol. I will probably never drink alcohol again...The evidence on breast cancer and alcohol is becoming stronger, and in my situation I don't need to take chances. Anyway, my poor liver can't handle it right now, and when it gets better (it WILL get better - the meds are shrinking the tumors) I would be a fool to stress the liver again for any reason. UCSF, a National Institutes of Health cancer research hospital where I get my treatment, publishes a series of booklets on nutrition and specific cancers. I brought home the breast cancer and nutrition handbook last week, and found plenty of things I didn't know. How about them pomegranates? 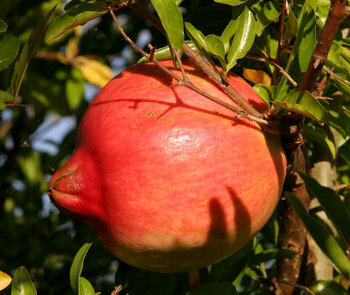 Research shows that pomegranates contain a compound that eats breast cancer cells. The most powerful form of it is the oil from seed, but you get the effects from eating the fruit or drinking the juice, too. We have great pomegranates here in California (people grow them in their yards) and I have been eating them this month; I also take about 500 mg of the seed oil daily. Cruciferous vegetables: I knew they were good for you, and I ate broccoli pretty regularly before my diagnosis - hey, even my kids eat broccoli. But I didn't realize how important cabbage is. Its cancer-fighting properties are stronger when it's raw or lightly cooked; it's extra powerful when it has been fermented. I eat sauerkraut almost every day now, and have gone through two jars of Korean kimchee (spicy fermented cabbage) in the last month. Eat much less red meat (I eat none at all now). Don't eat grilled foods - those delectable charred bits are full of carcinogens. Eat cold water fish, especially sardines and anchovies and other such fish low on the food chain. Of course you knew you should eat whole grains and plenty of fresh produce. Now if you want to add a little broccoli to your menus, why don't you just steam the florets lightly and dress with lemon juice, olive oil and salt? My hubbie also likes it with parmesan and olive oil. Quinoa is actually pretty tasty, you know. Just rinse it in a lot of water, repeating about four times. The saponin makes it taste bitter so you can't just rinse in a little water - flood those grains. Then cook as for white rice - water to quinoa ratio is 2:1; salt; a fat like olive oil or butter; bring to a boil then simmer on low for twenty minutes. Turn off flame and let stand for five minutes, fluff and serve. It's like South American couscous but much higher protein, with a lightly nutty flavor. Click here to access the podcast of the radio show which features a five minute clip of me reading from my Homelands Anthology essay: UpFront: American Empire at Home and Abroad - NAM. I wouldn't say that this comment is exactly about me and Palestinians - the title is "Heartbroken for Lebanon". The excerpt does deal with my relationship to Ain-el-Helweh camp, which lies in part on my family's property. For my Bay Area readers: this will be rebroadcast on KALW-FM at 2:30 pm on Sunday, October 28th. My piece is a five minute segment within a half-hour program, so you'll have to listen to the whole thing to hear me. Maybe we really will see these gangsters in the dock one day: DONALD RUMSFELD CHARGED WITH TORTURE DURING TRIP TO FRANCE | Center for Constitutional Rights. The criminal complaint states that because of the failure of authorities in the United States and Iraq to launch any independent investigation into the responsibility of Rumsfeld and other high-level U.S. officials for torture despite a documented paper trail and government memos implicating them in direct as well as command responsibility for torture – and because the U.S. has refused to join the International Criminal Court – it is the legal obligation of states such as France to take up the case. In this case, charges are brought under the 1984 Convention against Torture, ratified by both the United States and France, which has been used in France in previous torture cases. Next year in the Hague! We went to Harbin Hot Springs to take the waters and experience nature in the mountains. The trees - some of them - are beginning to turn yellow, gold and red, and the sun shone upon us for much of our visit. Our first night we were in the warm pool beneath the stars when it began to rain, just over the pool. But the giant fig trees that canopy half the pool protected us. Every culture seems to have a tradition of using natural springs to heal. I am grateful that our new age hippies in California keep this tradition alive. You can go to all kinds of warm/hot springs resorts in this country, many of them quite fancy or built up. Harbin keeps its accommodations simple - although the restaurant food is excellent, and you can of course get organic coffee and espresso in the cafe. This is California after all. The main point of visiting Harbin is to soak in the pools, meditate, and tune in to the forces of nature. Free yoga classes all day, lots of places for meditation, and a library full of all manner of books on healing, meditation, organic gardening and so forth. In consideration of my more conservative readers, I will gently glide over the whole Tantric yoga aspect to Harbin, which is not really my scene. It is also an alcohol and drug-free resort (on 1800 acres of mountain forest) so the energy is extremely grounded. My husband noted how serene and respectful people are there. No blustering drunks. No icky sexual prowling of the sort you encountered in the 70s (or even the more unbuttoned early 90s). Everybody pretty much focuses on the waters, of which there are seven springs. The hot pool is almost unbearable - I merely splashed myself with it, could not stand to go in. It's hotter than the temperature at which you culture yogurt. The warm pools are approximately body temperature, and the cold pool is 60 degrees Fahrenheit which is a couple of degrees below 20 Celsius. (I didn't go in the cold pool either). The resort uses a complex filtration system with ozone and stone filters and peroxide to clean the water without using chlorine. They claim that the water from the hot pools has not seen the light of day in a hundred million years. I don't know how they know this. The pool house for the hot water is quite eerie at night, with a Buddha and flowers in one niche, and jack-o-lanterns carved in peace and Sanskrit symbols all around. My husband floated me on my back beneath the stars last night, with the fig trees leaning over us, and I nearly wept with joy. The air temperature was pretty chilly (October in the mountains) but being in the warm pool is a delight. Then when we got too cold, we went in the sauna (or sat on a bench at the edge of the hot pool and splashed ourselves). Oh yes, and all the tap water at the resort is mountain spring, filtered again with no chlorine. The taste is exquisite. It is not a sulfur or lithium or arsenic springs resort, as others in the area are. The water here is supposedly quite good for you, and it tastes delicious. The resort claims that test results reveal it tastes better and is of better purity than their "famous neighbor" (that would be Calistoga). In the room you find a paper discussing their water quality. Harbin suggests that if you really want to spend $1 for a liter of water, why don't you just drink the Harbin water out of the tap and donate the money to your favorite charity in Harbin's name. Then at the bottom of the page they provide a little label which you may cut out and tape onto your room's sink faucet, if you need to think you are really drinking designer bottled water, direct from the source. I found the joke amusing. I had a clean glass juice jar which I kept filled from the tap, and I must have drunk about 10 glasses of the stuff each day I was there - or more. This morning I took a sun bath on the deck overlooking the canyon, facing Mt. Harbin with its cover of mixed conifers and hardwoods. The hardwood trees were turning yellow with autumn. I could do this twice a month. Eight of us Mills MFA graduates, mostly class of '07, meet regularly to discuss books and read our works in progress to each other. We work under the inspiration of our teacher, Micheline Marcom, who urged us to let great writers open us. Let them inhabit our work. Write back to them. Write in conversation with them. So we read King Lear and write a "response", usually as part of a work in progress. My King Lear response showed a raving grandmother at the hour of her death in Lebanon 1985, fighting with her offspring who want her to flee. My response to Michael Ondaatje's Running in the Family featured cousins sitting around on the balcony in Lebanon 1995, with the expatriate relative looking out at the old homestead and musing, much as Ondaatje's narrator does in his memoir. My work and my characters are very much my own, but it's freeing and inspiring to let great literature seed my own writing in this manner. I have organized a reading series for us titled The Ecstacy of Influence. We took the name from a Jonathan Lethem essay calling for appropriation and influence in literature. Our first reading will be Tuesday, October 23, at 7:30 p.m. in Oakland California. Place: Laurel Books, 4100 MacArthur Boulevard in Oakland, corner of 39th Avenue (across from Lucky's, about halfway between High Street and 35th Avenue). Bookstore phone: 531-2073. If you have time and interest, we would love to see you there! Friday, October 26th at 12 pm, tune in to KALW-FM, 91.7 in the San Francisco Bay area to hear me read an excerpt. The show will repeat Sunday the 28th at 2:30 pm, and the podcast link should go up around that time. Working with the radio editor was great fun - I should remember to read all my work aloud several times before going to the final draft. Making it more vivid for radio really improved it (and made it better for the many public readings my editors organized). I loved doing radio - it was a thrill, and I hope to do it some more. I will post the direct podcast link when it gets published to the internet. I'm still only focusing on the good news: U.S. Cancer Death Rates Are Found to Be Falling - New York Times. Death rates from cancer have been dropping by an average of 2.1 percent a year recently in the United States, a near doubling of decreases that began in 1993, researchers are reporting. Yup. I intend to live a long time insha'allah. Len Traubman, who works with the organizers of Camp Tawonga's Palestinian-Jewish peace camp, alerts us to this newspaper article about the recent gathering: Palestinians, Jews unite at Yosemite camp. Good for what ails you: Trying to save the world through the power of laughter and yoga. Laughter yoga reduces stress. Kataria claims that it also reduces blood-sugar levels in diabetics, lowers blood pressure, reduces depression and alleviates insomnia. Watch John Cleese investigate laughing yoga clubs in India - this made me guffaw out loud. Wow: Gore and U.N. Panel Win Peace Prize for Climate Work - New York Times. The Nobel Peace Prize was awarded today to Al Gore, the former vice president, and to the United Nations’ Intergovernmental Panel on Climate Change for its work to alert the world to the threat of global warming. What a sign of hope.